Bogs, lake shores, and swales, in sandy or peaty, acidic soils. Admitted to our flora with trepidation; many of our specimens are sterile and seem clearly to be the primary hybrid V. lanceolata × V. macloskeyi, however, some collections do appear to be fertile. The hybrid V. blanda × V. lanceolata, suspected to be the identity of at least one Michigan collection, would key here, but be distinguishable by slight pubescence on the leaves. MICHIGAN FLORA ONLINE. A. A. Reznicek, E. G. Voss, & B. S. Walters. February 2011. University of Michigan. Web. 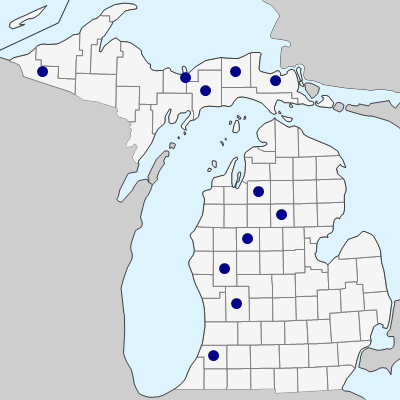 April 21, 2019. https://michiganflora.net/species.aspx?id=2792.